The German Bundesliga Mainz 05 live streaming at your place and at your device. FSV Mainz 05, Mainz 05 e.V. 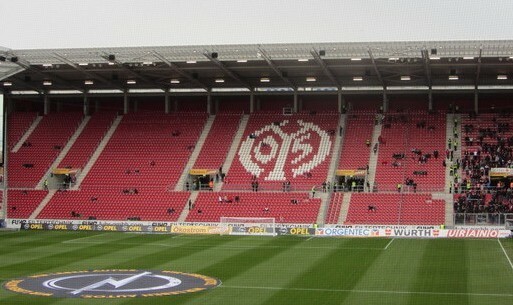 commonly known as Mainz, established in Mainz, Rhineland-Palatinate on 16th March 1905, since 2011 their home ground is Opel Arena. In addition, the current president of this club is Harald Strutz, the manager is Rouven Schrode. The current head coach is Martin Schmidt and currently, they participate in German Bundesliga. Moreover “the O-Fives”, “Carnival club” are the club’s nicknames.watch the live coverage of Mainz 05 football matches in HD quality. Current players are: 1 Jonas Lossl, 2 Giulio Donati, 3 Leon Balogun, 5 Jose Rodriguez, 6 Danny Latza, 8 Levin Oztunali, 9 Yoshinori Muto, 10 Yunus Malli, 11 Emil Berggreen, 15 Jhon Cordoba, 16 Stefan Bell, 17 Jairo Samperio, 18 Daniel Brosinski, 20 Fabian Frei, 21 Karim Onisiwo, 22 Andre Ramalho, 23 Gianluca Curci, 24 Gaetan Bussmann, 25 Jean-Philippe Gbamin, 26 Niko Bungert, 27 Christian Clemens, 29 Devante Parker, 30 Besar Halimi, 32 Pablo de Blasis, 33 Jannik Huth, 38 Gerrit Holtmann, 42 Alexander Hack, 45 Suat Serdar, 46 Florian Muller, 47 Philipp Klement. Out on loan players are Pierre Bengtsson, Florian Niederlechner, Robin Zentner, and Maximilian Beister. The O-Fives have won German amateur champions, Kreisliga Hessen (I) champions, Bezirksliga Rheinhessen-Saar (I) champions, Bezirksliga Main-Hessen (Hessen group) (I) champions, Regionalliga Südwest (II) champions, Oberliga Südwest (III) champions, Amateurliga Sudwest (III) champions, South West Cup winners, German under 19 champions and Under 17 Bundesliga South champions. The FSV Mainz 05 II was established in Mainz and it is concerned with FSV Mainz 05. The current manager is Sandro Schwarz and currently, they play in 3. Liga and the current stadium is Bruchwegstadion. Current players are: Maximilian Rossmann, Alexander Hack, Tevin Ihrig, Noah Korczowski, Matti Steinmann, Patrick Pflucke, Daniel Bohl, Mounir Bouziane, Philipp Klement, Dennis Franz, Florian Muller, Devante Parker, Mike Andreas, Tim Muller, Benjamin Turner, Felix Lohkemper, Aaron Seydel, Charmaine Hausl, Marcel Costly, Bilal Kamarieh, Malte Moos, Patrick Huth, Lukas Walkowiak, Leon Kern, Patrick Schorr, Patrick Manthe, Heinz Morschel, Marco Aulbach,Maurice Neubauer, Niki Zimling, Besar Halimi, Gerrit Holtmann. Oberliga Sudwest (IV), Verbandsliga Sudwest (V), Landesliga Sudwest-Ost (VI), Bezirksliga Rheinhessen (VII) and South West Cup.